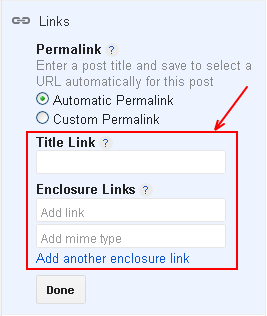 Blogger brings back Title Links and Enclosure Links to new Blogger Interface | NewbieTechTips! For some time now Google has been upgrading its Blog Publishing Platform Blogger. The new features are rolling out to the blogger users in batch wise manner. Along with the new features Blogger also bringing back some of the features and settings which were available in the Classic blogger interface. It’s a screenshot of permalink option. The highlighted part is the addition. Now with this update, the post author can specify a different link to the post title. Enclosure links are for Podcast or Video files. This options were available in the Classic Blogger, but were not available in the new blogger. It seems that Google decided to bring this feature to new interface also.